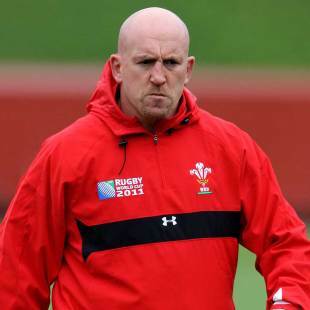 Wales defence coach Shaun Edwards has backed a partnership of Jim Mallinder and Sir Ian McGeechan as the ideal combination to take over from Martin Johnson as the next England manager. Edwards was a name in the frame to take over from Johnson but prior to the World Cup winning captain resigning his post as England team manager, Edwards had already committed his next four year to Wales. And the former Wasps coach believes his former boss McGeechan and Saints director of rugby Mallinder are the ideal pair to step into Johnson's shoes. "We should go for the best of the guys currently coaching here, say Mallinder, alongside someone of unparalleled experience, say McGeechan," Edwards told BBC Sport. "My guess is they'd develop as a partnership and develop England's young team at the same time. "To my mind, he [Mallinder] has already got most of what it takes to be an England coach. First with Sale and now with Northampton, he has turned sides around and last season came within a fingertip of claiming the Heineken Cup." And Edwards also believes that the Rugby Football Union should look closer to home rather than pursuing an expensive overseas option. "The mindset seems to be that if you come from Australia, South Africa or New Zealand that's enough of a CV," Edwards said in his column in the Guardian newspaper. "John Kirwan, who was a fine player, only coached up here with Italy. When Eddie Jones left Saracens they were about seventh in the Premiership. "True [Mallett] once led South Africa to 17 consecutive wins, but the last of those was in 1998. I can't accept that because someone comes from the southern hemisphere they have an advantage. The thinking appears to be that Twickenham goes out in the market and buys an off-the-peg winner - a White, a Graham Henry. That seems like flawed thinking." With Rob Andrew's job currently under scrutiny, Edwards believes the former England fly-half should be accountable for the red rose's recent failings. "Rob Andrew has the air of a man who either is or thinks he's in charge," Edwards added. "And in that respect shouldn't he perhaps think about his own position, even if someone else isn't about to do it for him? "Meanwhile, big men, like Johnson, take the rap."